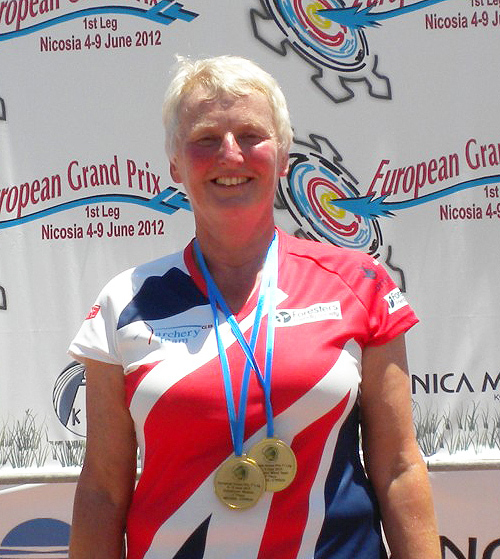 Pauline Burfitt from Chippenham Archers joined the Great Britain Team at the European Grand Prix (1st Leg) in Cyprus, 4 June through 9 June 2012. Pauline was ranked first in the ranking round with the score of 661. She shot next in the semi finals against Helen Pahter of Israel scoring 140 to 138 to win. This put Pauline into the Gold Medal Match against Katarina Durna of Slovakia were she scored 131 to 127 to take the gold medal. Pauline won Gold in the Women’s individual compound and also took Gold with Phillip Glover for the mixed compound team.